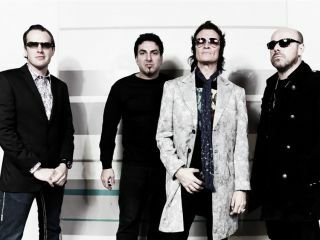 Black Country Communion, the supergroup consisting of Joe Bonamassa, Glenn Hughes, Derek Sherinian and Jason Bonham, have announced that they will release their third album Afterglow on 29 October. Recorded in California at Westlake Village Studios, the new record has been produced once more by Kevin Shirley, the man behind numerous releases from the likes of Aerosmith, Dream Theater, Iron Maiden, and essentially Black Country Communion's 'fifth Beatle'. Check out the video trailer above to see the band members talk about the new collection and to hear a few sneaky song clips, then scroll down to see the full tracklist and artwork.